Some time ago, we were writing about adventures of a wolf called Lucky on his journey in search for… luck . You can see on the map how long was his trip: from Drawsko Forest to Bydgoszcz Forest, covering a straight-line distance of about 150 km. He crossed many obstacles: villages, roads, railways, open agricultural areas with no cover. He finally made it to Bydgoszcz Forest, where he found happiness, in his case… a she-wolf. Now, the wolves explore the area together. We will see if they will have pups . Bison love to rub. 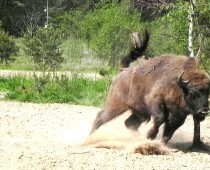 Any objects with rough surface can serve as “bison brushes”. 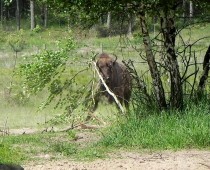 The free ranging bison also use rugged structures, like tree trunks. 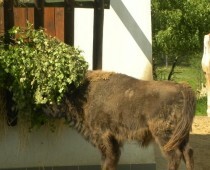 Rubbing against objects helps bison to shed the winter fur and get rid of ticks. To rub the whole body sometimes requires impressing gimnastic skills. 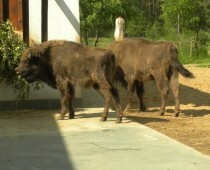 The Opening Conference for LIFE Project “Diversification and development of European Bison population in north-western Poland” (LIFE13NAT/PL/000010) took place on 17 July 2015 at the Bison Centre in Jabłonowo. The conference started at 9 am. 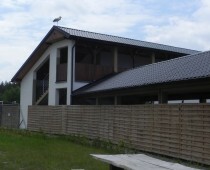 The program included four lectures and visiting the Wild Farm, intersected by coffee breaks. The first speaker, Magdalena Tracz, gave a lecture entitled “Diversification and development of European Bison population in north-western Poland”. 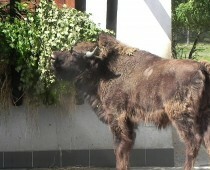 The next speech “Conservation of European Bison in north-eastern Poland” was given by prof. Wanda Olech. The third speaker, Maciej Tracz, talked about “Practical aspects of Bison conservation”. 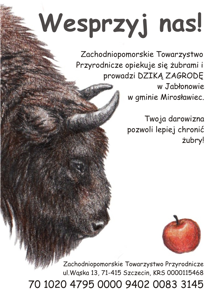 Finally, prof. Rafał Kowalczyk gave a lecture entitled “A new approach to management of European Bison populations”. 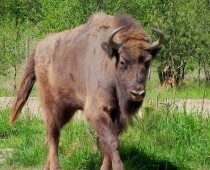 After the lecture session, all the participants were invited to dinner and for a field trip involving observation of wild-living bison in the Mirosławiec forestry district. Meanwhile, the project council had the openeing meeting to plan the working schedule. Wild Farm meets with increasing popularity among visitors. 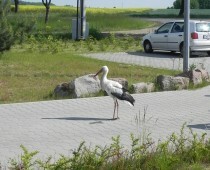 In recent days a likeable winged guest decided to come to us. 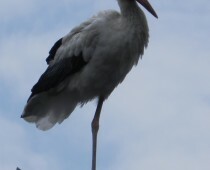 After a stroll on the parking lot and observation of the enclosure area from the strategic spot on the roof the stork flew away for a next journey. You are welcome to come again!